We’ve been fans of Farmers Markets for years, long before they inception of Mullins Farms. They’re a great way to get to know your local growers as well as enjoy a wide selection of fresh fruits and vegetables; especially produce we’ve never tried before. 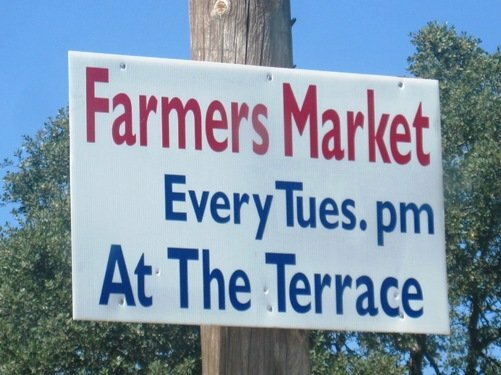 Offering fresh foods, local honey, olive oil, and homemade crafts, and more, the Valley Springs Farmers Market occurs on Tuesday evenings in the summer months, between June and September, at the Terrace Plaza on Vista Del Lago along Highway 26. Next to the Farmers Market, also in The Terrace Plaza, are several stores and restaurants including a coffee shop, health food store, meat market, a Fusion Grill restaurant, and a bakery. You could easily spend your whole Tuesday there! The coffee shop, Common Ground, is one of the places in Valley Springs with free Wi-Fi service for their customers. The health food store, Health Habit, has a nice selection of Gluten-free products; I bought my Step-Dad a bag of the pretzels and he loved them. They taste just like regular pretzels, and are really quite tasty. The T W Meat Company may be our Rocky Mountain Oyster hook-up in Valley Springs. Fingers crossed! This entry was posted on Friday, August 12th, 2011 at 11:25 PM	and is filed under Local Farms & Ranches. Both comments and pings are currently closed.